Kaldewei NexSys is a real shower surface revolution. The innovative 4-in-1 system, which is already pre-assembled at the factory, consists of a waste channel, sloping support, sealing and an enamelled shower surface enabling ultra simple and fast installation by professionals. 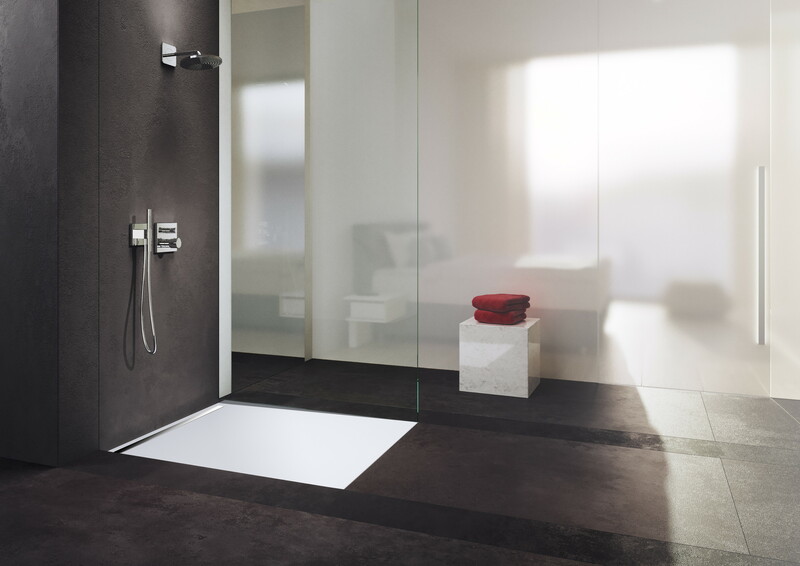 NexSys takes a completely new approach to floor-level showers, perfectly combining two worlds: with one of the main advantage being it is a seamless shower surface made of steel enamel with the design of a tiled shower area with a shower channel. The Kaldewei NexSys opens up a new market segment and rings in the change from shower channel to channel shower. This innovative product will be available in eight sizes on launch. It is not only in visual terms that the NexSys is revolutionising the shower market, Kaldewei is also a trail blazer when it comes to shower surfaces with regard to installation. The pre-assembled system of waste channel, sloping support, sealing tape and shower surface can, for example, be positioned directly in the screed recess after height compensation – a significant time saving for bathroom professionals. Thanks to the low built heights, floor-level installation is also possible with a limited construction depth. NexSys has no interior contour whatsoever making it ideal for insertion into the bathroom’s tile grid – like a large enamelled tile. Franz Kaldewei GmbH & Co. KG is a worldwide partner for iconic bathroom solutions shaped from superior steel enamel. With a portfolio of over 600 shower surfaces, washbasins and bathtubs, the premium manufacturer provides perfectly coordinated solutions for project business and private clients – featuring a uniform material throughout and harmonious design KALDEWEI steel enamel products have demonstrated their distinctive material advantages in the bathroom over decades. The company has been recognised as “Brand of the Century” and has also received over 150 awards; thanks, in part, to its collaboration with internationally renowned design companies. Founded in 1918, KALDEWEI is now represented in more than 80 countries around the world, either by its own subsidiaries or by sales partners.